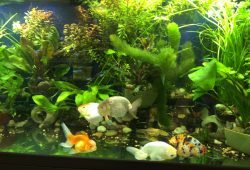 The article gives you some information on Growing aquarium plants. When people first buy an aquarium, the focus is on the fish and how to keep them alive. Live plants are placed in the aquarium for decoration and given little if any further thought. Usually by the time they turn attention to growing plants, it may be too late to save the plants they already have. So here are some basic tips to get a jungle happening in your tank. 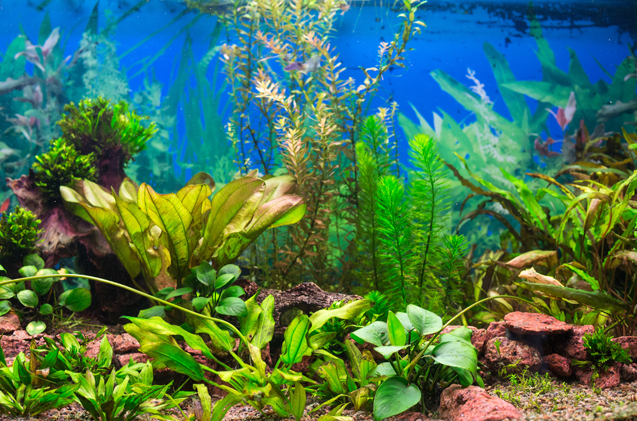 In nature plants grow in soils, this is impractical in an aquarium, as our water would constantly have suspended particles making it difficult to view the fish. Fine gravel of about 2 – 3mm in size is a better option and plants will grow quite well in this. Make sure when you purchase the gravel that it will not effect the pH of the water. This especially the case with gravels collected from beach or ocean areas. Aquarium plants grow best in gravel with a depth of about 5cm as lesser amounts may make it difficult for the plants to anchor properly and establish roots. Like outdoor plants, aquarium plants depend on light so they can perform photosynthesis, which is the process that plants use to make their own food. Aquarium plants need primarily the red and blue parts of the light spectrum more than others to carry out this process. Fluorescent tubes are a cost effective way of lighting most aquariums, but always use a tube designed for aquarium use as normal household tubes provide too much light in the yellow and orange part of the spectrum and not enough in the red and blue. The effectiveness of a tube is about 12 –18 months and at this point it will tend to promote the growth of algae at the expense of plant growth. Plants require about 8 – 10 hours of light per day and if possible this should be over the same period each day, for example, 10.00am – 8.00pm. Unlike their terrestrial cousins, aquarium plants gain much of their nutrient from the water itself. The two key nutrients here are iron and carbon. Carbon is usually derived from carbon dioxide that is released into the aquarium by the plants and the fish. The other key nutrient is iron and although small amounts maybe present when you first set the tank up, it will need to be added on weekly basis as this initial reserve is quickly exhausted. Iron can be added to the aquarium via a liquid plant food such as Flourish Iron and Basic grow. There are numerous trace elements that plants use to complete their day to day functions. 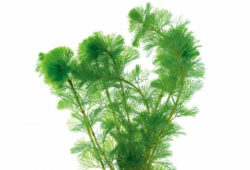 Owing to filtration and the growth of the plants in the aquarium, these are quickly depleted and should be replenished. Often as little as 1 – 2ml a week is all that is required. Finally as strange as this may sound, ensure that you purchase true aquatic plants. Many of the plants that are sold in some pet stores and aquariums are actually ornamental plants. These plants will live under the water for only a few weeks even when you have the conditions for plant growth correct. 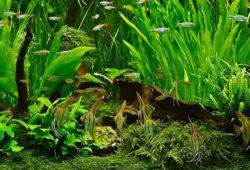 We only stock true aquatic plants and another way to be certain of this is that true aquatic plants are usually sold under their Latin name.